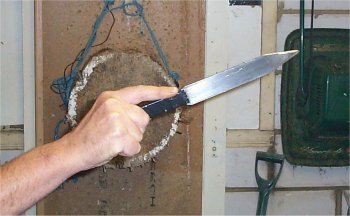 For many years I have been throwing knives by using only a half-spin, and my method has been explained here in previous newsletters, so I wont dwell on that. A few months ago, one day I was practising on my garden throwing range and I just started thinking about the way I have always thrown. I don't know why, because after 50 years of happily half-spinning I certainly did not intend to alter my method, nor did I need to. But I suppose it was because of all the new throwing friends that I have made, and met on the Internet, and exchanging ideas and listening to all the things that they do that I never knew existed. I find that when I throw alone my mind wanders onto other things, and I throw almost automatic without actually concentrating on the throwing. I may think about business, and the problems of the day, or some other daily thing. Babes, or the like. This time I was thinking about throwing, and for no reason that I can recall, I thought "if I can throw a 30 foot half-spin, then I should be able to do at least a 12 foot no-spin or something similar". I was aware that there would be some spin but if this could be reduced to a minimum, there might be a new fun way to throw. The reason this throw is also called a "1/4 Spin" is because when the knife leaves your hand the tip is pointing just about straight up in the air. And when it reaches the target it is pointing just about straight in front of you (90 degree difference) and thats a 1/4 spin. I knew that I would have to make prototype knives that would be more suitable and that I would have to concentrate on the handle area because this would be the all-important factor. I also knew that the throwing would be similar to my half-spin where I control the rate of spin to suit the distance. I also knew that there could be a problem with the knife turning sideways cause there would be no way to stop it doing that. When you spin a knife this problem does not arise, or at least is minimal. So with my past knowledge of making knives suitable for long half-spins I set about making what I considered to be some new knives for straight, or nearly straight throwing. 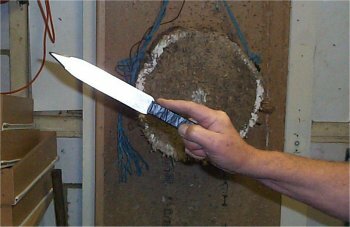 A knife is about as aerodynamic as a house brick and there is nothing that can be done to improve that so I knew that the knife would have to be more or less, centre-balanced, and that the throwing itself would be the key factor, in keeping the knife on a near straight line. (WOW). I wanted to make a knife and not a "throwing thingey" that had flights or some other "stuff" to aid the flight. I made many prototypes and I won't go into detail on that but I reached a suitable and comfortable design, and weight that I knew was good, at least until I reach a limit and may want to try and go further. So I made 20 knives. The knife is 8ozs, and has to be that weight cause the throw requires some force, in order to keep the spin down. The handle is only 3/4" wide and that is necessary to get the correct grip which is a little unusual to say the least. The blade is straight, as are all my half-spinners, and is 1 1/4" wide. The length is 12 1/2", and the knives are 1/8" thick. The knives are case-hardened to 10 thousandth of an inch deep, and this gives a glass-hard coat with a pliable core. I have got to a distance of 18 feet, but it is very hard work so I am continuing at a shorter distance of up to 15 feet. As with my half-spins the throw pattern has to be altered once the throw is longer than 10 feet otherwise the knife starts to spin slightly and sticks with the handle a little upwards in the target, but unlike the half-spin, alterations are not so critical, and mostly a little more power is all thats needed coupled with a longer follow through and a greater throw-arc. What does need a lot of practise is in keeping the knife from turning left-or-right, cause it has to leave the hand in a straight line. But this is all in the fun of acquiring the skill, and if it were easy there would be no point in doing it. 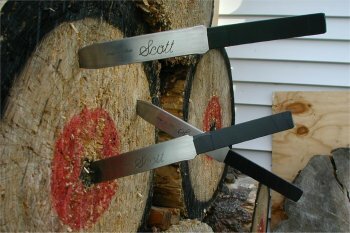 Sometimes the knives look like a bunch of flowers, at all different angles sticking from the target, but its there to be conquered. It is very difficult to explain how the throw is performed, but if you bear with me I will try my best. The handle is not held in the usual manner, it is held between the index finger and thumb, as near to the end of the handle as possible. Then the forefinger is laid flat along the top of the handle and is pushed against the part where the blade starts. The remaining fingers are wrapped around the handle at the end using as tight a grip as possible. Keep all fingers as near to the end of the handle as possible, but keep the forefinger pressed up against the blade stop. This grip is important, the throw cannot work in any other way, it might feel odd but the nearer the end the grip is, the better. It should be held so as the knife cannot be pulled from your hand (just before the throw). The knife is 12 and a half inches long, so in the grip, and not counting the extended forefinger, there should be about 10 inches of knife ungripped. Try to keep the knife in a straight line from your hand, cause with no spin there is no way to stop it turning left or right. Try pointing it at the target before the throw, and keep the blade as vertical as possible, you will find that the blades twist in the air but this does not matter, the important thing is the stick, the other things can be corrected as you go along. When you throw the knife the follow through is all-important, the forefinger should end up pointing at the floor. Dont dodge around this point, its important. 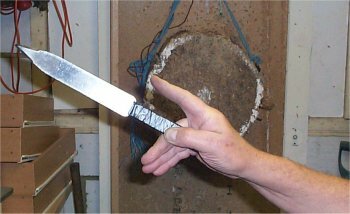 Remember, its the forefinger that controls the knife, press it tightly along the handle and try to wipe it along the handle top as the knife goes. Without this action it will not work. Dont get ambitious, this type of throwing is very difficult, its a spin off from my long range half-spins, and i can only get away with it cause of my years of being used to controlling the spin patterns of my half-spins. Its a fun way to throw, and i would call it recreational, cause it is hard to aim properly and i could be wrong but i dont think it would ever be used in a competition, but i would like to see someone prove me wrong.